Ayatollah (UK: /ˌaɪəˈtɒlə/ or US: /ˌaɪəˈtoʊlə/; Persian: آيت‌الله‎, translit. āyatullāh, from Arabic: آية الله‎, translit. ʾāyatu llāh "Sign of God") or ayatullah is a high-ranking Usuli Twelver Shī‘ah cleric. Those who carry the title are experts in Islamic studies such as jurisprudence, Quran reading, and philosophy and usually teach in Islamic seminaries. The next lower clerical rank is Hujjat al-Islam. The term was not commonly used as a title until the early twentieth century. 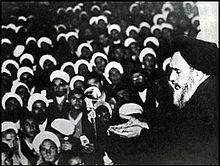 The title of Ayatollah became popularized with the creation of Qom Seminary in 1922. There are a few women who are equal in ranking to the ayatollahs but are not ayatollahs, and are known as Lady Mujtahideh. A Mujtahid cannot have a congregation. The most outstanding in recent history was Nosrat Amin, also known as Banu Isfahani. Current examples of the Lady Mujtahidehs are Zohreh Sefati and Lady Ayatollah Aatieh Hassani, also known as Imam'ah Al-Hassani, daughter of Grand Ayatollah Gholamreza Hassani. Historically, there have been several Mujtahidehs in Shi'ism, most famously the women in the family of Allama Hilli, as well as the Baraghani family of 19th-century Qazvin. Only a few of the most important ayatollahs are accorded the rank of Grand Ayatollah (Ayatollah Uzma, "Great Sign of God"). When an ayatollah gains a significant following and they are recognized for religiously correct views, they are considered a Marja'-e-Taqlid, which in common parlence is "grand ayatollah". Usually as a prelude to such status, a mujtahid is asked to publish a juristic treatise in which he answers questions about the application of Islam to present-time daily affairs. Risalah is the word for treatise, and such a juritic work is called a risalah-yi'amaliyyah or "practical law treatise", and it is usually a reinvention of the book Al-Urwatu l-Wuthqah. There are 86 Maraji (plural of Marja') living worldwide as of 2017, mainly based in Najaf and Qom. The most prominent of these include Ali al-Sistani, Seyyed Ali Khamenei, Muhammad al-Fayadh, Muhammad Saeed al-Hakim, and Bashir al-Najafi in Najaf; and Hossein Vahid Khorasani, Mousa Shubairi Zanjani, Sayyid Sadeq Rohani, Lotfollah Safi Golpaygani, Abdul-Karim Mousavi Ardebili, Naser Makarem Shirazi and Yousef Saanei in Qom. ^ Künkler, Mirjam; Fazaeli, Roja (2010-07-12). "The Life of Two Mujtahidahs: Female Religious Authority in 20th Century Iran". doi:10.2139/ssrn.1884209. ^ Emad El-Din Shahin (2016). The Oxford Handbook of Islam and Politics. Oxford University Press. p. 400. ISBN 9780190631932. ^ Among the Shia, a mujtahid is a person generally accepted as an original authority in Islamic law, i.e. an ayatollah. ^ Siddiqui, Kalim (1980). The Islamic Revolution: Achievements, Obstacles & Goals. London: Open Press for The Muslim Institute. p. 26. ISBN 978-0-905081-07-6. ^ Ḥairi, Abdul-Hadi (1977). Shi-ism and Constitutionalism in Iran: A Study of the Role Played by the Persian Residents of Iraq in Iranian Politics. Leiden: Brill. p. 198. ISBN 978-90-04-04900-0. ^ "مجموع مراجع الشيعة الأحياء لبداية 2017م مع محل سكناهم ومواقعهم الالكترونية". منتديات يا حسين.